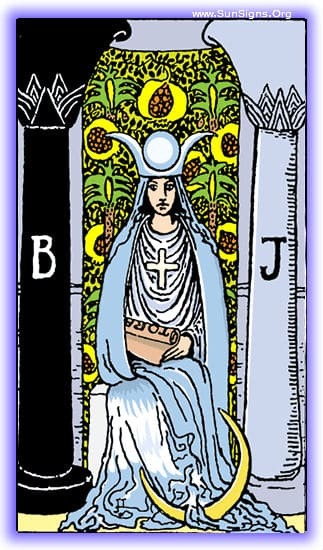 The tarot meditation for the High Priestess card upright is a place of peaceful inaction and wisdom, observation and non-interference until the time is right. Once the time and space is right for an uninterrupted meditation, place the card in front of you. When the candle and incense are lit, take a few breaths to center. Look at this Major Arcana card without actually seeing it. You’ll feel a sense of falling or being ‘drawn’ into the card, accompanied by a sense of ease. You will find yourself in a chamber, all about you will be chaos, people will be frantically going about their business attempting to get things done. They will dash to and fro, pester each other about minor details, and perform pointless tasks. The noise can be unbearable, it may be the crash of dishes or the constant talk of the bidding room floor in wall-street, whatever it is, it will be constant and frenetic. Your first task is to find the High Priestess. She may be sitting aloof and above, watching those scrambling around her with quiet contemplation. She may be moving among the crowd, untouched, serene, like a rock around which the waves of the chaos breaks. But she is not idle, even when sitting above, her eyes and ears take in everything. She may pause to watch a conversation, she may pick up a paper and set it aside, but none of her actions are hurried or frantic. She is merely aware of her surroundings, and waiting for the answer to her current situation to present itself. You may be able to speak with her, she may be too withdrawn too answer, it largely depends on how deep into the meditation you have gotten, and where you, personally, are. There will be a lesson for you among the chaos, and in time it will make itself apparent to you. Try to emulate the Priestess, try to embrace that serenity and quiet observation. It is in that place that the true lesson of this meditation will reveal itself to you. If you maintain a tarot journal, be sure to write down your thoughts. Pay special care to the chaos of the room you were in, how the priestess maintained her serenity, and anything else that seemed particularly important to you. Remember that the High Priestess tarot card meditation means is quiet wisdom and observation.